The debut book from Mexico’s best chef, Enrique Olvera, pioneer of contemporary, authentic Mexican food and global gourmet influencer. Enrique Olvera is the most famous and celebrated Mexican chef working today. Olvera’s restaurant Pujol was ranked #1 in Mexico and #20 in the world at the World’s 50 Best Restaurant Awards. This is his first book and the first ever high-end chef cookbook in English on Mexican cuisine. It captures and presents a new contemporary Mexican style of food, rooted in tradition but forward thinking in its modern approach. Olvera has pioneered and defined this new way of cooking and belongs to a global group of gourmet influencers that includes Noma’s Rene Redzepi, Dom’s Alex Attala, Osteria Francescana’s Massimo Bottura and elBulli’s legendary Ferran Adria. Olvera rethinks how to use traditional, authentic local ingredients using unusual flavor combinations to create a reinvented way of cooking and eating. 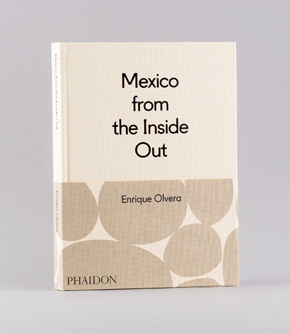 Mexico from the Inside out includes both sophisticated and more accessible recipes to explain Enrique's philosophy, vision, and process. He is fueled by a constant exploration of Mexico's ingredients and culinary history, and inspired by his early family memories about food. This book goes beyond stereotypes to reveal new possibilities of Mexican cuisine, which is now an essential part of the international conversation about gastronomy. Over 65 recipes, each with an elegant photograph, from the sophisticated dishes served at Pujol to more accessible casual dishes that he enjoys with his family at home. More than 100 atmospheric photographs capture the vivid mosaic of the Mexican landscape while tip-in pages bring the reader up close to Enrique’s vision and philosophy about food. Tacopedia is an encyclopaedic tribute to the vibrancy of Mexican taco culture. Explore one of Mexico's most popular culinary traditions through 100 recipes accompanied by interviews, street and food photography, illustrations, graphics, and maps that bring the full story behind each taco to life.Tacopedia's highly graphic style will appeal to hip taco lovers, food truck enthusiasts, and serious followers of Mexican cuisine, both young, and young at heart.Features:Foreword by internationally renowned chef René Redzepi.&nbsp;100 authentic recipes adapted from the Mexican best-seller from fillings and tortillas to salsas and sauces.&nbsp;Illustrated with 250 photographs, and accompanied by interviews, stories, illustrations, graphics, maps, and more that bring the vibrancy of the taco, and its homeland, to life.